The FanMatrix™ concept combines advances in plenum fan, variable frequency drive, and computer aided design technology with proven fan application techniques to answer growing customer requests for improved fan systems. Simply put, it is the latest step in the evolution of fan system application. An important item to note is that once the number of fans needed to appropriately meet the customer’s requirements has been determined, increasing that number is generally counterproductive. At that point, more does not mean better, it is simply more; more points of service, more potential points of failure, and higher cost. VFD Considerations and Electrical RequirementsCurrent variable frequency drive (VFD) technology allows for drive output frequency to run from 0 to 120 Hz with most, if not all, standard manufacturers’ drives. This allows motors to operate at speeds up to double their standard 60Hz synchronous speeds, and is a key reason that FanMatrix™ systems can be applied effectively. Standard premium efficiency motors rated for use with a VFD are suitable for this duty as long as the rated motor amps are not exceeded. The motor does not care what speed it is running, and modern premium efficiency motors can be effectively applied at VFD outputs up to 120 Hertz. The bearings are designed for speeds well in excess of these higher motor RPM values. 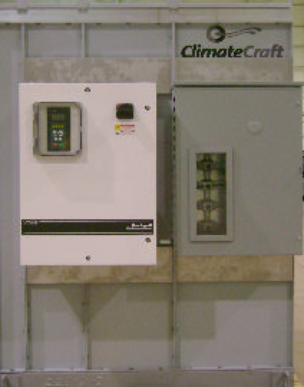 In addition, ClimateCraft FanMatrix™ units feature motors rated for VFD duty, meaning that they have heavier duty winding insulation rated 1600 volts; L10-200,000 hour rated bearing life, and clamped rear bearings. The VFD now allows the fans to operate at the required RPM, similar to that of a belt drive wheel without the belts. For instance; if the selected fans need to run at 2340 RPM, an 1800 RPM motor can be selected to run at 2340 RPM by setting the VFD maximum output frequency at 78Hz. The VFD allows establishing the required fan operating point, and a 78Hz design point provides a wide modulation range for VAV application. It is also important to remember that even though modern VFD/fan motor technology allows the motor to run at rated output over 60 Hz, a motor’s capability will fall off when operated below 60 Hz and, therefore, selecting a motor/VFD combination to run at <60 Hz at design conditions is not advised. For example, a 10 horsepower motor operated at 50Hz will have an available output of only 8.333 horsepower (50/60 x 10 = 8.333), but the electrical service to the motor must still support its nameplate amps. Another design consideration when selecting motors at other than 60 Hz is the application of manual bypass systems. A motor set up to operate at other than synchronous speed (60Hz) at design conditions requires special review since mechanical bypass may not be appropriate, as it can only run the fans at 60Hz in the event of VFD failure and not at the design RPM. For example, a fan/motor selected to operate at 68Hz at design conditions would deliver only 88% of design airflow when operating in bypass. Conversely, a fan/ motor selected to operate at 52Hz would deliver 15% more air than design when in bypass, with resulting motor overload and duct over pressurization concerns. If redundancy is necessary, dual full sized drives with manual or automatic switchover is the best choice, particularly since the cost difference between a mechanical bypass and a redundant VFD is often insignificant. When multiple motors are applied on a VFD (a very common and effective industry application), each fan motor should be factory wired to an electronic manual motor protector (MMP) which serves as a combination motor overload, motor disconnect switch and short circuit protection. The VFD cannot serve as the motor overload on multiple motor applications. All motors can then be factory wired to a common electrical terminal block specifically designed to accept multiple conductors on the load side of the device, and then a basic 3-wire connection is available to the variable frequency drive. Multiple conductors should never be grouped into a common lug not designed for that purpose. The ability of a fan to generate the required static pressure is directly related to the tip speed of the wheel and, therefore, multiple smaller wheels will need to run at higher RPM than a single larger wheel. This generally is a good thing as it can improve the acoustic qualities of the fan system. The dominant sound frequency of an airfoil fan is a function of its “Blade Passage Frequency” which in turn is a function of the number of fan blades (either 9 or 12) and the fan speed (RPM). Large wheels in single or dual fan applications will often produce this dominant frequency in the 1st or 2nd octave band, and this is the characteristic “rumble” which is so difficult to attenuate. If multiple smaller fans are used in a FanMatrix™, this dominant frequency may shift to the 3rd, 4th or even 5th octave band, making the sound easier to attenuate. The total sound power in watts will remain essentially the same, however. Because these higher frequencies are easier to attenuate internally, the resulting discharge sound levels will be lower, and may possibly eliminate the need to use additional sound attenuation. To achieve the same effect as a 10dB shift from the 1st octave band to the 4th would require approximately a10 foot attenuator in the duct. To maximize system performance, the system designer needs to weigh the advantages of multiple steps of redundancy versus the relative efficiency of using smaller fans and motors, and then choose the optimal balance. For fans, maximum available efficiency values generally reach their peak at sizes 24” and larger in diameter, so selections in that size or larger are generally recommended. In addition, fans are most efficient when selected at their full, standard width, so this should be a standard selection criteria. For motors, efficiency ratings are on an increasing scale with motor size. For example, the NEMA efficiency rating of a 20 horsepower premium efficiency 6 pole motor is over 3% higher than that of a 5 horsepower motor. The cumulative effect of choosing fewer, larger fan and motor combinations can have a significant impact on operating budgets, especially for 24/7 building operations. There are currently no independent third party certification programs, i.e. AMCA, for fan performance when fans are applied in multiples in a common plenum. However, having access to AMCA Certified data for the individual fans being employed can provide the engineer an added level of confidence when looking at an AHU manufacturer’s overall fan performance. This data can be requested from the AHU manufacturer. 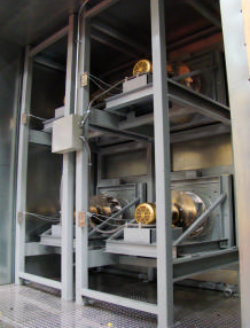 When considering vibration control in AHU design, two different and distinct areas must be reviewed:1) Potential resonant vibration of the fan structure, and 2) Vibration transmission to the building structure. Much like an opera singer causing a glass to shatter by finding the right pitch to set up a resonant frequency in the glass, a resonant frequency in a fan assembly can have disastrous results, generally manifested as premature bearing failure. Since in a direct drive system the fan bearing is actually the motor bearing, it is the motor itself that will fail. This cause and effect has been recognized in the HVAC industry for many years and is demonstrated every day when a Test & Balance technician runs a fan through its entire operating range and sets lockout frequencies on the VFD. These VFD lockout frequencies do not prevent the fan system from moving through a resonant frequency, but they do prevent the system from operating at that potentially fatal frequency for any period of time. In a multiple fan system such as a FanMatrix™, finding and locking out all of the damaging resonant frequencies may be difficult or impossible to achieve, so the right tactic is to eliminate the potential for resonance during equipment design. Resonance is defined by the MSN Encarta® dictionary as Physics- large oscillation at natural frequency: Increased amplitude of oscillation of a mechanical system when it is subjected to vibration from another source at or near its own natural frequency. It is this increased vibration amplitude that causes mechanical failures. In a fan system, therefore, the design goal is to eliminate any matching frequencies of the rotating fan assembly with the natural frequencies of the structure to which it is attached. This can be done using well established Finite Element Analysis engineering design tools. These design tools guide the engineer in designing the necessary stiffness into the structure to eliminate any natural frequencies from within the rotational operating range of the fans. This is an involved process for the AHU designer, but once accomplished, the job is done and is no longer left up to a tedious field start-up procedure. It is this type of analysis and design process that has allowed some manufacturers to provide a 5 year warranty on the rotating assembly. 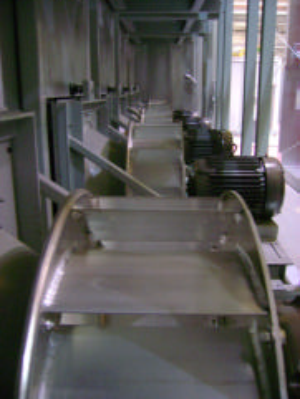 Vibration control is a concern in any piece of equipment incorporating a rotating mass. ASHRAE Applications Chapter 47, Table 48 recommends a minimum of .75” deflection spring isolation for centrifugal fans using motors less than 40 HP and operating at speeds greater than 500 rpm. This encompasses all fan array applications. Also, in a fan array, there is more happening than just the vibration of the individual fans. Under certain system conditions, a harmonic vibration may be set up causing the entire array assembly to oscillate. If the fans are not individually isolated, the structure they are attached to will vibrate and this vibration will in turn be transmitted to the building structure if the unit is not isolated from the building structure. Good engineering practice dictates that the fans be individually isolated to eliminate potential problems associated with vibration transmission to the building structure. For example, the ClimateCraft FanMatrix™ system utilizes a unique 3- point isolation design on each individual fan/motor assembly. This provides complete isolation in all planes, as well as incorporating thrust restraint capabilities, and it requires no field adjustment. The assemblies are then also seismically restrained to meet applicable code requirements, such as compliance with the seismic provisions of the IBC. Good fan design requires a minimum of 1 wheel diameter clear space upstream of a fan inlet to provide good inlet conditions. 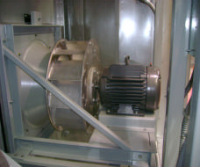 Using the smaller fan wheels inherent in a FanMatrix™ design allows the unit to be shortened due to the reduced inlet space requirements, and discharge side length is reduced due to the smaller physical size of the fan assemblies. Care now must be taken to ensure that enough space is still provided to allow for appropriate service clearance on the up-stream and downstream sides of the fan array, since the length required for good flow conditions may now be less than that required for service. The unit length and the associated space and cost savings will still be significantly less than that required for a traditional fan system. The use of these devices must take this into consideration along with the additional complexity and resultant service requirements, with the final decision a balance between the required redundancy and first cost and operating cost. The bottom line for the system designer to consider is that although fan system selections are often based on worst case conditions, i.e. maximum design load such as the ASHRAE 0.4% condition and dirty filters, the systems will spend a negligible amount of time operating at that condition. Review with the assistance of the manufacturer will often indicate that the loss of a single fan in a system will still allow the unit to provide more than adequate airflow until repairs can be made without the added expense of dampers, oversized motors, etc. Reliability is a key feature being sought out by end users who are investigating fan array systems. To them, reliability is multiple fans and back-up electronics that minimize the impact of a failure as well as minimize the downtime associated with repairs. To manufacturers like ClimateCraft who have done extensive vibration analysis and other design review, reliability also means reduced failure rates, and they back up the confidence in their design with five year warranties that cover the rotating assemblies, i.e. fans and motors. All prospective suppliers should be asked to confirm that they provide a five year limited warranty on the rotating assemblies in their fan array systems. 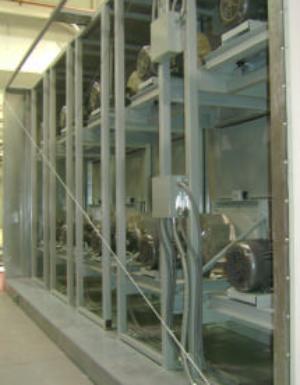 The FanMatrix™ system utilizes multiple plenum fan wheels in diameters, from 12” to 27”. Motor sizes are available from 3HP to 30HP with most running from 10HP to 20HP. This gives a typical maximum motor/wheel assembly weight less then 250 lbs. This allows for easy replacement by facility service technicians in case of a motor failure. There are no belts to adjust or fail, and no drive alignment requirements to be made. Less technical expertise/training is required from service technicians. This reduces the potential down time and reduces potential service costs. In most cases, a motor can be replaced in less than one (1) hour; a huge savings over the down time associated with a single, larger horsepower belt drive motor. In the event of a motor failure, there will be reverse flow through the inoperative fan. If the number of fans used in the design will allow over-speeding of the remaining fans, flow can be maintained at or close to required levels. Auxiliary contacts can be provided with the motor overload relays to provide a failure signal to the Building Automation System. Units utilizing a fan array should include a shutoff plate sized to cover the intake of a single fan such that the facility maintenance staff can conveniently block the back flow until a unit shut down can be scheduled to replace the inoperative assembly. Some designers may opt to use backdraft dampers when the array uses a small number of fans, and given a failure, the remaining fans are not able to produce the necessary flow. However, the additional static pressure in intake losses attributed to back-draft dampers will increase the required operating horsepower, and therefore the power consumption over the life of the unit. The cost difference between a unit of conventional design and a FanMatrix™ unit will be negligible as long as each uses the appropriate housing dimensions for the application. Units with a FanMatrix™ will include more internal electrical costs but less housing cost due to the reduced length required. There should be less than 5% difference in cost from one to the other.